Our core goal at B2C Jewels is to make your shopping a pleasant and worthy experience that is secure and risk-free. To ensure this, we are committed to back our products and services with several benefits and assurance policies which means that you can shop with complete confidence. All jewelry items and loose diamonds at B2C Jewels are returnable within 30 days from the day you receive it. This 30 day return policy is our bid to ensure that you are completely satisfied with your purchase, or we will make it right. Shipping is free on all orders within the United States - both ways. We acknowledge the responsibity of delivering your purchased product(s) safely and securely using insured shipments. 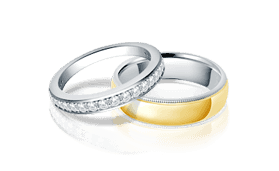 For your peace of mind, all B2C Jewels items are covered by a 1 year manufacturer's All-Inclusive Universal Warranty, which covers defective parts experienced under normal wear, and the labor required to repair them. Our service continues long after the sale. Our customer service support team is available for the life of your product. Upgrade your diamond at any time after your purchase. We are committed to offer the best price available on certified diamonds. 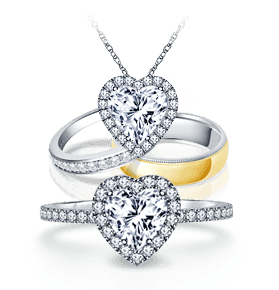 If you find the same certified diamond available online at a lower price, we will be glad to match the pricing for you. We invite our happy customers to tell us about their shopping experiences. Read and watch their stories on how we ensure delivery of quality, value and service to help you shop with confidence. We carry a strong legacy from the diamond industry with a built reputation and trust over the past few decades. With a family which has been in the diamond industry as renowned wholesalers for the past 30 years, it goes a long way with our business partners who value us. We never compromise on quality. We believe in giving the best value to our customers and ensure the use of the finest metals and top quality diamonds for all our products. From our pool of wholesale resources, we sell straight to you, the consumer, so that you get maximum savings and value of every dollar spent. The products bought from our site give you significant savings with prices up to 25% to 50% less than full retail. We encourage customers to know their product well in order to make the right decision. In accordance to this, our education section has been carefully designed to help you learn everything about diamonds, gemstones & jewelry and guide you through the selection process. 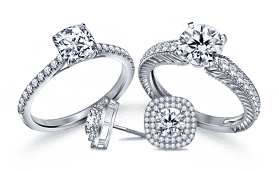 Our jewelry consultants are also available to guide you in every way and can be reached on 1 - 866 - 522 - 2539 to answer any of your questions. We have over 200,000 high quality certified loose diamonds online that you can choose from. As a proud supporter of the Kimberly process, B2C Jewels makes sure that every diamond is bought from established dealers in the industry to ensure that the diamonds come from a source free of conflict. Each certified diamond is accompanied by certification papers which ensure you of the quality and credibility of your diamond. Our site is tested and certified daily by the Norton Secured Seal, which ensures that the information provided by you is in a safe and secure environment. Our payment systems are foolproof and Verisign Secured. We take data security very seriously and ensure that any personal information provided to us remains encrypted and protected.